The Thanksgiving holiday weekend is over, but it is technically still fall for a little while longer. I also like this mani too much not to post it. It was very "last minute" but it got a thumbs up all around at dinner on Thursday. 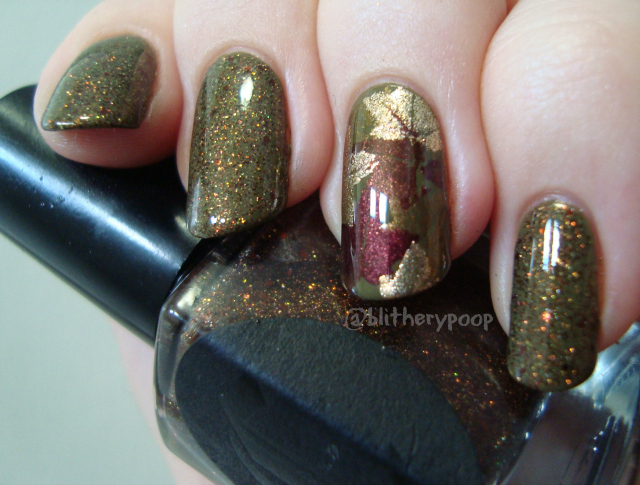 I used Sally Hansen Loden Green as the base and topped it with Cirque French Roast. The accent is stamped at various weird angles with the largest leaf from the trio of leaves on Bundle Monster's BM-004 (revised) plate. I used four Sally Hansen Insta-Dri shades for the stamping; Bronze Ablaze, Mochachino, Coco A-Go-Go, and Go For Gold. Bronze Ablaze wound up being kinda hard to see, but the pile of leaves look worked nicely. Hope those who celebrated had a great, feasty time and got a good bargain or twelve over the weekend. I finished up my Stash Spam yesterday, by the way. Like the holiday it was a lot of work, but fun and worthwhile.